Lake Bluff Yacht Club is located in Lake Bluff, Illinois along the shore of Lake Michigan north of Chicago. This provides an excellent place to enjoy sailing and learn in many varied sailing conditions. Mission Statement: "The Lake Bluff Yacht Club will be a world class Sunfish sailing club providing the highest quality sailing programs, including racing instruction, family participation, social activities, and community involvement"
Membership consists of 130 families in Lake Bluff and the surrounding communities. If you are an experienced racer but have not been active in a while, we have an easy way to get back into one-design competition. We have a collection of club boats and a friendly, experienced fleet of racers who also compete in other sailboat racing venues including the Chicago to Mackinac race. Youth Sailing instruction is provided in partnership with the Lake Bluff Park District. Visit the Lake Bluff Park District website for more information. Many Social events throughout the year provide both sailors and non-sailors with opportunities for fun and companionship. Events include a Brunch on the Bluff overlooking Lake Michigan, and a Lobster Boil on the beach. For questions on - Slot Assignments, Boat Compound Keys, Boat ID Tags, Boat Storage - contact Building & Grounds committee, Tim Flentye-boatstorage@lakebluffyachtclub.org, or use our 'contact us' page. If you are interested in getting more involved in LBYC to help with Social activities or Sailing activities, send an email to our 'general' mailbox at general@lakebluffyachtclub.org, or use our 'contact us' page. Sunfish for Sale in excellent condition This 1983 boat is dry,stiff, and does not leak. The boat comes with all equipment, a Windline dolly, and an Illinois Title.. Do you need a storage slot at the LBYC Compound for this season? If so talk to me as I have one I will not be able to use. The price of the boat is $950. Call me at 847-724-4729 and enjoy sailing your new Sunfish. Accessories: New deck cover, sail bag, paddle, wood daggerboard and rudder,daggarboard dolly, AMF insulated bag (fits in transom), extra daggarboard. Only two owners. Trailer not included. Located at Dempster beach. 4. John Palizza, Commodore and Doug Warren, Regatta Chair presenting the Jack Brown Trophy to Paul John Patin with Greg Gust, second and Eugene Schmitt. LBYC's Rich Chapman finished 5th. 7. First race, with gusts up to 25 knots. Fun at the beach today setting installing 17 sails for the upcoming Championship of Champions regatta next weekend. In the pictures are Rob Stelling, Gretchen Seymour and Charlie Rush. Also in attendance were Rich Champman, John Palizza and Leland Brode. I am still looking for a few volunteers as well as welcoming all participants. Please try to make it down for our first annual paddling event with LBYC!!! The Lake Bluff Yacht Club has been selected by US Sailing to host the 2016 Championship of Champions Regatta. The event, which will be held October 6 - 9, 2016 will be sailed in one-design Sunfish sailboats on Lake Michigan immediately off the shoreline of Lake Bluff. The event is one of the most prestigious sailing championships in the United States and features nineteen current national or North American one-design sailboat class champions competing in a round robin format. With the Sunfish being a single-handed boat, all of the boats being alike and the boats being rotated among the competitors, it is the best sailor, not the best or most expensive boat or sails, that wins the regatta. We are honored to have been selected to host this event and we look forward to seeing some of the best sailors in the country come to our little Yacht Club. New Blog Feature - Insert Image - use the new Image button. Viv and Gordon were founding members of LBYC, participating in club events almost to the end. Viv was out sailing her Sunfish only a few months before she passed. There will be a memorial service for them on Saturday, October 24th from 3:00 pm until 4:00 pm at Union Church, 525 E. Prospect in Lake Bluff. We hope club members can take some time to remember them. Now that summer is over, I thought it would be interesting to take a look at the racing results for the Summer Series. In total we sailed 47 races. I have been told that in the past we have averaged 55 – 60 races during a Summer Series, so the overall number of races sailed was down somewhat. I ascribe this to a couple of factors: First, for most of the summer we experienced light winds, which meant that the average race took longer and most days we sailed 3 or 4 races instead of 4 – 5. Second, because we had more boats on the line (more on that in a bit), the total time for all boats to finish a race was longer. For example, if the top finishers get around the course in 15 minutes, but the slower competitors take 25 minutes to finish, over the course of 3 races that adds up to 30 minutes, which is one less race per day. In terms of the number of boats racing, for all 47 races the average number of boats was 11.75. If you exclude the first day of racing, a chilly and blowy day when only 4 boats went out, the average number of boats competing was 12.3. Again, excluding the first day, the lowest number of boats in a race was 8, while the highest number was 18. I have also been told that in past years the average number of racers was around 10, so this year saw a nice jump in the number of boats racing. There are several reasons for this but probably two main ones. The work that Charlie Rush and Leland Brode put into making sure we had club boats available that were in good condition for people to race, lead directly to at least 2 or 3 new members who like to race. Additionally, we are becoming known as one of the few places on the Chicago shoreline where you can find an active and competitive one design fleet. Good sailors like to sail where there are lots of boats to compete against and we have that. We even had one sailor come up from the St. Louis area a couple of times just to sail with us. Overall we had 29 people come out and race during the course of the summer; 14 sailors raced in more than 20 races, and another 2, were close with 19 and 17 races. In business terms, these are our core customers and we want to keep them interested and involved while continuing to build the involvement of the 13 people who sailed anywhere from 11 - 1 races during the course of the summer. Over 20 said they were coming, 16 showed up and 11 actually sailed in the steadily increasing winds. By the last race the winds had increased to over 20 knots before we finally called it a day. This weekend six LBYC racers will be heading for the Lone Star State to sail in the Sunfish North American Championships held at Rush Creek Yacht Club. The regatta will take place on Lake Ray Hubbard and will be sailed over 4 days. Holly, Fritz, Charlie, Meg, Gretchen and Rich have been putting in some extra training time in order to prepare for the regatta. The fleet will feature approximately 60 sailors not only from the US, but Guatemala, Venezuela, Ecuador and Peru as well. When you haven’t sailed all winter, and the first three Sundays of the sailing season present conditions that prevent racing, you’re apt to resort to desperate measures. So it was on Monday, when Rich Chapman suggested we go out for sailing practice. The air temperature was about 52 degrees, just about matching the coolness of the water. To top things off, there were 2 – 3 foot waves left over from the 20 knot winds we had on Sunday. This did not deter the intrepid sailors of the Lake Bluff Yacht Club however. Eight sailors showed up, just for a practice sail. That’s more boats than many clubs get on a regular racing day. We donned wetsuits, fleeces and spray tops and launched into Lake Michigan. And what do you know – when we got out on the water it was great. The wind was blowing about 13 – 15 mph, which meant that you had enough speed to power through the chop, and you could do some surfing coming down off the waves. It was just a lot of fun. My only complaint was that by the end of the session, I could barely feel my wet fingers. But hey, that’s a good excuse to drink rum afterwards. The good news is that, on average, conditions have been perfect for sailing over the past two Sundays. The bad news is that you can’t sail averages. On Sunday, May 17th seven intrepid sailors made their way down to the beach to do what sailors all over the world do – stand around, look at the sky, gauge the wind and waves and mutter among themselves. Of the seven who came to the beach, six eventually rigged their boats and five launched into the surf. Unfortunately, the combination of high winds, choppy water and chilly conditions resulted in racing being cancelled. Sunday, May 25th saw the converse of the previous week’s high winds – little to no wind. The result was eleven boats bobbing around on Lake Michigan collecting lake flies and chilly toes. After an hour of waiting for the wind to show up, we called it a day and went in for refreshment. So just remember, when someone tells you that, “On average, things are pretty good” they may really be saying that, on an individual basis, things could be a whole lot better. The season has started for the Lake Bluff Yacht Club – Saturday saw both the Boats In / Compound Clean Up and the Spring Cocktail Party. I’m happy to report that both events were a success; well attended by both old members and new members. I noticed something interesting about both events. It must be the Midwestern work ethic that prevails here in Lake Bluff, but both events got off to early starts. The boat compound was pretty much cleaned up by 11:00 AM, so that people showing up later to help found that they could get credit for putting in an appearance without doing too much work. On the social side, my wife Donna and I arrived at that evening’s party at the 7:00 PM start time, only to find it in full swing. I guess we’re just a work hard / play hard kind of club. Ah, springtime and a young man’s (or woman’s) thoughts turn to …sitting in a small fiberglass boat and getting splashed with really cold water until their teeth start to chatter. But before we can do that, and prove that it truly is cooler near (or in) the lake, we need to get our boats in the compound and the compound in shape. Your Yacht Club board, in its wisdom, has decided that this year boats-in day will be Saturday, May 9th from 10:00 AM to 2:00 PM (May 16th in the event of rain). This is a change from previous years when spring-cleaning for the compound was on Mother’s Day. After due consideration it was decided that way too much spousal capital was being used by holding a Yacht Club function on Mother’s Day, so now cleanup in on the same day as our Spring Cocktail Party. The theory here is that people will work up a hearty thirst working for the Club and then have the Club pay for their drinks. Now that’s what I call a fair deal. Why would you walk around town with pictures of polo ponies or alligators on your clothing when you could proudly announce your allegiance to the Lake Bluff Yacht Club instead? and we have established 3 logos for you to use when you order: a dark colored logo for use with light colored clothing, a light colored logo for use with dark clothing and a logo that is sized for use with baseball caps. Just go to the site, set up an account, and order to your heart’s content. Once you select the size and quantity of merchandise you want, a pop up window will appear asking you to select the type of logo you want and where you desire it to be placed. There’s a wide selection of merchandise available, from polo shirts, to fleeces, to baseball caps, so there is something for every taste and budget. Last, but certainly not least, Lands’ End often runs promotions where the cost of logo application is free. For example, their current promotion (Code: WELOGO) runs through April 3rd. We hope that everyone will turn out around town in spiffy Lake Bluff Yacht Club logo apparel. Welcome to our new LBYC website. The site will work equally well on PC, tablet or phone - content and functionality are the same. Please use the now blog to post questions, comments, activities, and anything of interest to other LBYC members. Doug Warren and I answered questions and tossed ideas around about how to go faster, and about how to get a better start. We drew pictures on a white board showing where to put tel-tales, and walked through various right of way scenarios. We then helped everyone to rig their boats for the windy conditions that day and all went racing. The NE wind and resulting waves were a challenge for all. The beginners held in there despite tricky waves and many capsizes. We had our 2nd Team race today with a 3 person team from LBYC and another 3 person team from Winnetka. The wind was light but enough to make us go. Lots of interesting tactics. The most entertaining was the entire Winnetka Flotilla ganged up of Rob on the last leg of a race to make sure he finish 5th instead of 3rd or 4th. LBYC Team: Leland Brode, John Palizza, Rob Stelling. A woman's corduroy jacket with cell phone was found at the LBYC Spring Cocktail Party last night, May 10th. The 2014 membership page is now updated. You can download the 2014 membership application form. I am on the hunt for a used Sunfish, and Sandy Rapp directed me this way. If you know of any for sale, would you please advise? Thank you. (312) 221-8367. Hope to join the line this summer! The fall series has another 2 weekends to go. The weather has been great so far this year and the water is still warm. Sunday July 21 was a great paddling day too! Had many fun rides back into the beach on the crazy waves. Sort of a "yahoo" kind of a day. All the swimmers were having a great time playing in the surf. And Carmen brought tasty snacks for us to share under the Shelter after the sailors got in around 4 PM. If you weren't there you missed a terrific afternoon. Next group paddle is Sunday Aug 4 at 1:30 PM and next "Waterfront Day" is August 18 - check your LBYC schedule and come on down. Sunday, June 23rd was a great day of sailing. We got in 4 races in moderate but shifty winds. 12 people came out for a great time on the water. Competition was tight. Earlier, 2 people participated in the Learn to Race program. Next program is scheduled for July. All sailors who want to learn to race are welcome. Yesterday June 9 group paddle was surfin' FUN w/ pros Kristen &Tim Flentye talking newbie moi through it. Next up is Sat June 22 around 3:30 PM before the Pig Roast. see you there! Hey all you paddlers! if you weren't there - and there were too many of you - you missed a great group paddle lead by Kristen Flentye. Five of us kayaked from Sunrise Beach down to Lake Forest beach and back. The water was fine and nobody went in...come on down for the next one June 9. We start organizing our gear around 1:30 PM for a planned 2 PM departure to somewhere out there. Sunday Racing May 30, 2013 Racing continues on June 2nd. Sunday racing is in full swing. Sailors of all levels of experience are invited to join the Sunday weekly race series. Boats leave the beach by 1:00 and racing starts at 1:30. All Sunfish Sailors - The first races of the 2012 fall race series start on Sept. 16th. The water is still warm and fair winds are predicted. Come on out and have some fun on the water. Series standings are reset again so everyone gets a fresh start. 1. Rules: The regatta will be governed by the 2009-2012 Racing Rules of Sailing, the prescriptions of the US Sailing Association, the rules of the International Sunfish Class Association, except as any of these altered by the Sailing Instructions. 2. Eligibility and Entry: All Sunfish sailors are eligible to race. 4. 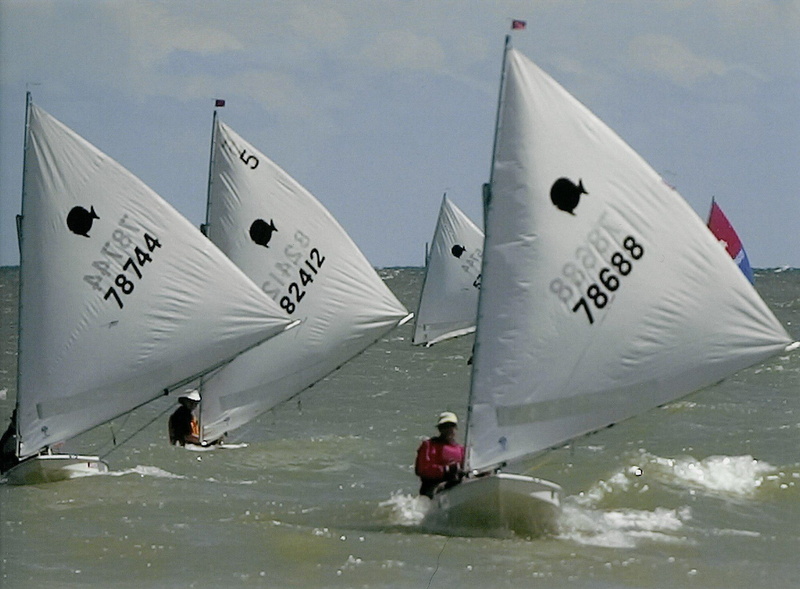 Registration: Competitors may register at the Lake Bluff Yacht Club on the day of the regatta or by completing the entry form and sending it with the appropriate fees to: Lake Bluff Yacht Club, PO Box 292, Lake Bluff, IL 60044. 5. Sailing Instructions: Will be available at the registration desk and reviewed at the Skipper’s Meeting. 6. Courses: The courses will be either Windward/Leeward, Triangle or a combination thereof. 7. Number of Races: Five races are scheduled. One race shall constitute a regatta. 8. Scoring: Scoring will be low point scoring system in accordance with Appendix A2 of the racing rules. 9. Prizes: Prizes will be awarded to the top 5 finishers and the top junior. Directions: From the south: I-94 north to Rt. 176. 176 east into Lake Bluff. Go all the way to the end of the road, go one block north to the park entrance. From the north: I-94 south to Rt. 41 south. Continue to Rt. 176. Turn east and go all the way to the end of the road, go one block north to the park entrance. The John Sheppard Memorial Regatta is this Sunday, August 26th. First race starts at 1:30 PM. What an awesome day of sailing! Shifty winds, flat water, sunshine, 15 boats and great competition! Thanks to all who came out to race. Hope to see all of you and more this Sunday! Sign up for the 2012 NA's now. We promise a great regatta with good competition and social events. This year is the 50th Sunfish NA's. Join the celebration. Looking forward to a great season on the water! Two short months until we hit the water. Start getting the boat ready now! The last two weeks we have not had enough sailors to go out and race. Granted the weather has not been ideal. I hope we can rustle up a few bodies before the season is over. We had two perfect sailing weather days for the 2011 Sunfish Master's regatta on Sept 10th and 11th - 5 to 10 knots with flat water. Thanks to Doug Warren for a great job organizing the event. And the wave forecast is 8 to 12 feet - near shore.� Don't get too close! It looked discouraging with Sunday morning storms. Then 6 sailors showed up at the beach with a view of glassy water. Someone noticed rippled water on the horizon and it was headed our way. We finally got some very nice wind ( 6 - 8 knots) and flat water. We had five races, but had to change to the course 4 times with wind coming from the Northeast, then East, then Northeast, then North. The Near Shore weather forcast said the wind was supposed to be 10 - 20 from the Southwest, then 10 out of the West - not very accurate. Anyway it was a great day for sailing, and hope all of our Mac Race and Sunfish North Americans travelers return to sail next week. Good luck to all the folks sailing in the North Americans this weekend... do LB proud!